Born of the Virgin Mary! This is the House of God and the Gate of Heaven. The Mother and Child are wrapped snugly, seemingly one, to signify their union in the Holy Spirit. Only the two Heads and the Hands of the Child Jesus are visible. His right Hand is raised in blessing, while the left Hand holds the orb of universal kingship. Grace is a Christian mystery. It is at once a ‘Pearl beyond Price’ and our greatest treasure. All grace comes through Jesus Christ. Before the Birth of Christ, there was no grace. Grace is Trinitarian as was explained by the Angel to Mary: The Holy Ghost will come upon you, the power of the most high Father will overshadow you, your Child will be called the Son of God. There is only One God and He is TRINITY. People who deny the Trinity, do not know the true God, but some imposter. Our Christian life is a personal relationship with the three Divine Persons. We love each in a different way as the Creed explains. We love God the Father as Father and worship Him as Creator, offering Him especially, the sacrifice of His Son in the Eucharist. We worship the Son as the Word Incarnate, really present among us. We listen to this Beloved Son, in Whom the Father is well-pleased. We are His disciples and learn from Him the truth that we cannot be His disciples without willingly sharing His redemptive Cross. We worship the Holy Ghost by cooperating with Him, Who wishes to sanctify us. We hear His voice in the Scriptures and in the authentic teaching of the Church. We do not resist His desire to make us holy and perfect. We do not grieve Him through sin. We acknowledge that the Holy Ghost is spousally joined to the Blessed Virgin and mediates sanctification through Her. We receive and value the Sacramentals She recommends because these come from His divine power; from Him to us, through Her Immaculate Heart, which is His worthy dwelling place. Until now, the greatest prerogative of Mary was Mother of God. This title is consistent with mere creature-hood. The Immaculate Heart suggests a close kinship with God, (as in Lk.1:35) that Mary was overshadowed by the Holy Ghost and made Mother by Him, thus indicating a permanent spousal union of love. In God’s plan, spouses lose a good portion of their individuality to be fused into a union which has a paschal dimension. The spouses die to self to resurrect in the union of man and wife, mother and father. They are no longer two, but one. This is the Father’s Will to make their unity perfect. The Holy Ghost is Love. To perfect His loving of humanity, the Holy Ghost appropriates and uses the Immaculate Heart of Mary. Where it is difficult for a human heart to be moved, to respond to pure spiritual love, the Holy Ghost uses the Immaculate Heart of Mary to love humanity, most especially the sacred humanity of Christ. Jesus is acutely sensitive to human love and is pained by indifference and hatred. During His exile among the hardened hearts of sinners, the Holy Ghost’s possession and use of Mary’s Heart as if it were His own, ensures that Jesus will be loved on earth as He is in Heaven. Families, who pray the Rosary, invite Mary into their homes. She never comes alone. The Holy Ghost, Who always accompanies Her, will bring faith and every good gift. The true holy people of God, born of Mary and the Holy Spirit, will not fail, despite the raging of Satan against the Church. God has equipped His Mother admirably to defend Her children. St. Augustine talks of two cities: The City of God, where men love God to the contempt of self and the City of the World, where men love self to the contempt of God. Purity of religion is not something to be taken for granted. Religion is that which links man to God. The Church is a colony of Heaven among sinners. It lives in the terrifying conflict that rages between all that is good and evil. Hell’s war against the Church is a continuation of its war against Jesus Christ. Satan’s goal is the complete extermination of Christians. There is no middle ground. The alternative to Christ is anti-Christ. Heresy is the devil’s vomit to wash away the Church. Satan’s primary goal is to infiltrate and pervert the pure religion of Jesus and thus create a false religion that will hand over the gullible to the power of the anti-Christ. God would have us possess a horror of false religions. It is for this reason, the pure religion of Christ has always condemned shared worship with other religions. False religion is the very worst of scourges. Satanic perversion of the Faith reached a climax in the Fourth Century in the form of Arianism. This nightmare of apostasy was expelled from the Church at the Council of Ephesus in 431 where it was solemnly defined that Mary is the Mother of God. In the 7th Century, a worse scourge appeared in which Asiatic pagans combined with Islam and denied the Divinity of Christ. For 1000 years, the Church was besieged. Survival and success was obtained through Our Lady’s victories at Tours in 732, Lepanto in 1571, Vienna in 1683 and others. Religion, pure and undefiled, finds its source in the Immaculate Heart of Mary. It is the noble vocation of the Immaculata to expose the schemes of Satan, to restrain him and to crush him. Heresy is directed against Mary, because She is the guarantor of the Incarnation, the central mystery of our Faith. Mary disposes of the merits of Christ and mediates the Holy Ghost. There is no contest; THE VICTORY IS HERS! God now wishes much more than simply the restoration of previous Marian piety. He commands that we establish true and visible devotion to Her Immaculate Heart throughout the whole Church. It is the Will of God that Her role as Mediatrix of All Graces be publicly and universally defined as a dogma of Holy Mother the Church. This very dogma was introduced formally at Rue de Bac, and a Medal was coined to commemorate it. Miracles, in abundance, have been obtained through its veneration. It was again announced with joy at La Salette and we were firmly warned by the Mother of God of the consequences the Church and the world would suffer if this was delayed. Pope Pius IX, the great Pope of the Immaculate Conception, said that the words of the Queen of Prophets at La Salette, were the light that guided his pontificate. Again at Fatima, Almighty God confirmed the reality of Our Lady, Mediatrix of All Graces by the miracle of the sun: God wishes to establish in the world devotion to Mary’s Immaculate Heart. How is it possible to discern the Holy Ghost from other spirits? It is the mission of Mary and the Holy Spirit to bring mankind to Calvary and there obtain the merits of the crucifixion of God. As the Redemption approached, it was Mary who made the vital decisions affecting Her Son. She withdrew Him from the publicity of the Temple when He was twelve. She over-rode His reserve at Cana and commanded the miracle which manifested His Divinity and led Him to the hour of His Passion. The Fourth Commandment gave Her maternal rights over Her Son but, surely, this forbidding and commanding of God, is unfitting in a creature. How could She know when He should expound the law or when He must begin to show His glory? It was the Spirit speaking to Jesus through Mary. They are so “TWO-in-ONE” as to be indistinguishable. Satan tries to dissuade us from the Cross while it is the mission of Mary and the Holy Ghost to lead us to Calvary. St. John persevered in prayer with the Mother of Jesus on Calvary. He received the Holy Ghost. After the Ascension, the Church persevered in prayer with Mary for nine days. It received the Holy Ghost. Mary and The Holy Ghost. It is Her union with the Holy Spirit that makes Her power of intercession omnipotent. Mary is the visible aspect of the Holy Ghost. Her Heart, so to speak, is the sacrament of His Love to mankind and, through it, flows the fullness of His Life, GRACE. A rejection of Her is a rejection of Him. When there is deliberate blasphemy against His Bride in Her Immaculate Conception, Her Virginity, Her Motherhood of God or Her holy images, His anger is terrible. What God has claimed for His own may not be profaned by man. Mary loves the One, Holy, Catholic and Apostolic Church with a divine love, the love of the Holy Ghost Who dwells within Her Immaculate maternal Heart. The Church is born of Water and the Holy Ghost and given by the Holy Ghost to Mary, His Spouse, to cherish and to educate. Disrespect or ingratitude by the Church towards Mary is an abomination. May God be with you! We are the SOLDIERS of Mary Immaculate, whose courage in following Her Son to the foot of Calvary has never been excelled. We are called to be firm of mind and purpose, to cast aside vain fear, and to summon all our powers and resources in order to achieve the Triumph of the Immaculate Heart of Mary. Love Her, Honor Her, Take Refuge in Her Immaculate Heart! Today, we are all suffering the consequences of our disobedience to the Bride of the Holy Ghost. Before each great divine intervention, the rule of Satan reaches a zenith. As we rush headlong toward world enslavement advanced by impurity, deception, betrayal and violence, the Immaculate Heart of Mary is our only hope. IN THE END … The entire world and everyone in it, consecrated to the Immaculate Heart of Mary, will be loving the Sacred Heart of Jesus with the only love fitting of Him; for, it will be the Love of the Holy Ghost in the Immaculate Heart of Mary breathing Love for Love: ONE GOD LOVING HIMSELF! PRAYER – The Life of Our Soul! The habit of prayer is no burden to ANYONE, for we can pray worthily at any time, in any place, and in any posture. Even the motion of the lips is not necessary; the mind and heart can be engaged in it: while we read or converse or go about our daily work. Moreover, prayer produces a delicious feeling of hope and rest in God; and this feeling is worth more than all the happiness that wealth can purchase or the world can give. God respects not the arithmetic of our prayers, how many they are; nor the rhetoric of our prayers, how elegant they are; nor the consistency of our prayers, how melodious they are; nor the logic of our prayers, how methodical they are; but the sincerity of our prayers, and how heart-sprung they are. There is a freshness about the early morning which belongs to no other period of the day. The sun has a more kindly brightness and the air a fresh crisp­ness which are lost largely as the day grows older. Upon awakening, we throw open the window wide and let in the buoyant atmosphere of the new-born day. It expands our lungs and brightens our eyes and makes us feel how good it is to be alive. What the new-born day is to our physical nature, the morning prayer is to the life of the soul. It is opening the windows of the heart that the clear air of Heaven may flow in. It re-invigorates the life within us and turns our thoughts toward the One we love the most. It is a source of renewed strength, and gives a buoyancy to the spiritual step and a clearness to the inner vision. It floods the heart with the breath of life and bathes it in the sunshine of God’s smile. Grant me, O merciful God, that what is pleasing to Thee I may ardently desire, prudently examine, truthfully acknowledge and perfectly accomplish for the praise and glory of Thy Name. Ordain, O my God, my whole life, and what Thou requirest that I should do, grant me to know it and to fulfill it as is meet and profitable to my soul. Give me Thy grace, O Lord, my God, that I may not fail in prosperity or in adversity, avoiding pride in the former and discouragement in the latter. May I rejoice in nothing but what leads to Thee, grieve for nothing that turns me away from Thee! May I wish to please and fear to displease none but Thee! May I despise, O Lord, all transitory things, and prize only that which is eternal! May I shun any joy that is without Thee, nor wish for anything outside of Thee! May I delight in no rest which is without Thee! Grant me, O my God, to direct my heart toward Thee and, in my failings, constantly grieve, with the purpose of amendment. Make me, O Lord my God, obedient without contradiction, poor without depression, chaste without corruption, patient without murmuring, humble without pretence, cheerful without dissipation, mature without dullness, prompt without levity, fearing Thee without despair, truthful without duplicity, doing good without presumption, correcting my neighbor without haughtiness, and edifying him by word and example without hypocrisy. Give me, O Lord God, a watchful heart which no curious thought will turn away from Thee; a noble heart which no unworthy affection will drag down; a righteous heart which no irregular intention will twist aside; a firm heart which no tribulation will break; a free heart which no violent affection will claim for itself. Grant me, finally, O Lord my God, science in knowing Thee, diligence in seeking Thee, wisdom in finding Thee, a conduct pleasing to Thee, a perseverance trustfully awaiting Thee, and a confidence finally embracing Thee. May I endure Thy punishments by penitence, profit by Thy benefits through grace in this world and enjoy Thy blessedness by glory in the next; Who livest and reignest, true God, forever and ever. Amen. Christianity is an upside-down religion. The Apostles themselves were accused of turning the world upside down (Acts 17:6). It’s not surprising that they would be accused of that. Jesus taught humility and service. Jesus taught contentedness and sharing. Jesus taught purity of heart. It’s an upside-down religion that will make no sense to many. We are tempted to look around us and regard what we see as the ‘real world’ where the attitudes and actions that are so prominent are necessary to cope. But, if we will let go of the ‘reality’ that we see in the world around us, and allow ourselves to be turned ‘upside-down’, we will discover a whole new world, another dimension to life that we never imagined possible. The most important message in the world today is one many successors of Peter have pointed us toward in recent decades. The message is neither sensational nor confusing; it does not concern itself with trifles; what it asks us to do is not impossible for us to attain; we can, in our own lives, help to accomplish it. It is … the message of Fatima. The message of Fatima is the best hope we have to obtain real peace in our world. If we really want peace, if we really want to avoid war, why do we not follow the requests of Our Lady of Fatima, Mediatrix and Co-Redemptrix? Perfect happiness consists in suffering much for Our Blessed Lord, who willed to suffer so much for us! We must give faith back to souls. There alone lies salvation for society and individuals. One with Mary, we can help many souls to encounter Jesus Christ; without Our Blessed Mother this cannot be done. We must dedicate our lives, our strengths, our health to this great mission. We must evangelize, for this was the very mission of Our Lord. We must 0 to the poor, to the workers, to the humble, to the little ones, to the abandoned and to all of those who suffer. We must speak to them, show them and teach them of the Kingdom of God. If we wish to triumph with Him, we must fight with Him. Everything speaks to us of the Cross. Contemplate the Crucified, for suffering is the consecration of all Christian life. Let us therefore take our stand at the foot of the Cross with Our Mother and His. Let us wield her Most Holy Rosary well, and reach out to all souls while it is still possible, for Heaven and Hell are locked in mortal combat and the earth shakes from the shock of the encounter. As the foundress of the Propagation of the Faith and The Living Rosary, Venerable Pauline Marie Jaricot was endowed with a unique vision and a profound common sense. 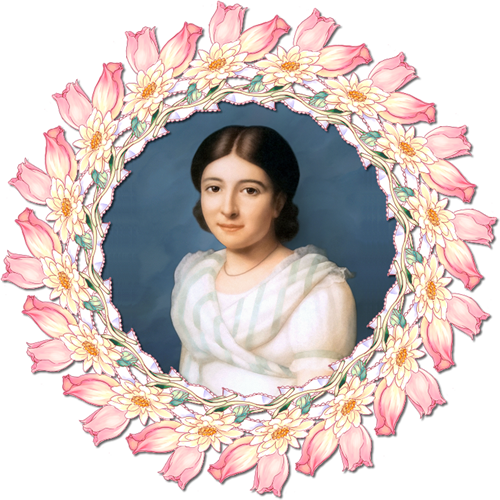 Pauline Marie Jaricot was born into a devout Catholic family in Lyon, France, on July 22, 1799. She had a deep concern for the peoples of Asia and dreamed of becoming a great missionary. At the age of 17, she took a perpetual vow of virginity and, at 18, she composed a treatise on the Infinite Love of the Divine Eucharist. Pauline was born 10 years after the French Revolution had trampled the doctrine, dogma and devotion of the Church underfoot. The revolution, lauded by the secular world in the name of liberty, equality and fraternity, brought much selfindulgence, cruelty, inhumanity and godlessness into the world. It sought to extinguish the light of Christian truth. The Living Rosary Association was founded by Pauline in 1826 to save the Church in France. It was born of humility, obedience and immolation. Pauline Jaricot was a victim soul who, at the height of her beauty, radiant charity and overflowing love and desire to serve the suffering, was advised by her spiritual director to separate herself from the world and live a contemplative life. She enclosed herself for three years inside the walls of her home where she prayed, read and suffered in loving obedience and patient resignation. The fruit of those 3 years of isolation and martyrdom was The Living Rosary Association. It was formally approved and richly indulgenced by Pope Gregory XVI, and accorded canonical status on January 27, 1832. Pauline’s triune plan embraced all that was Catholic. Regardless of station in life or financial means, all could participate. People throughout history have failed to understand the power of association. Satan, however, understands well the almost limitless power of association. The assemblies of the wicked derive their power and strength from the secret ties and oaths which unite their members. By association, these satanic forces spread division and disorder. This is their unholy goal. Pauline Jaricot took her mission to the factories, where she assembled the workers, prayed a decade of the Rosary and collected a penny for the apostolic works of the Association. Good Catholic literature was distributed in order to combat the voluminous writings of error in her day. By 1831, membership in the Living Rosary in France grew to 200,000. By 1837, some 1,000,000 were members, and 2,000,000 had joined before her death. The prayer of the Rosary, which has often been ridiculed as repetitious and childish, is mankind’s greatest spiritual weapon – the rampart against which the forces of evil have no defense. It is the most highly recommended and richly indulgenced prayer. It is a weapon “without equal” that will crush the enemies of Holy Mother the Church, and finally bring peace to our very sick world. As in the time of Pauline, the Church in the 20th century was betrayed by many of her own and continues to be betrayed in the 21st century! She is attacked by her servants as well as by Her enemies. Our Blessed Mother appeals to all men to “PRAY THE ROSARY” and to unite in prayer against the powers of darkness which are bent upon the destruction of the Catholic religion. The Living Rosary is not a new devotion but a continuation of the Rosary preached by St. Dominic and announced by Our Blessed Mother for centuries. In these days of evil, confusion, chaos and modernism, the Living Rosary will be a mighty force in every family because the Holy Rosary is a gift to us from the Queen of Heaven. On December 8, 1986, Richard and Patricia Joann Melvin in an effort to honor Saint Philomena and win her favor, began a revival of Pauline Jaricot’s Living Rosary ministry. With great hope, 30 people were gathered to pray a daily decade for the intention common to all: The Triumph of the Immaculate Heart of Mary and the honor of Saint Philomena. By September of 1987, 300 members had been enrolled. The Living Rosary started a small periodical in 1987 entitled DEDICATED DECADES, a copy of which was sent to Saint Philomena’s principal shrine in Mugnano, Italy. Sadly, devotion to St. Philomena in Italy and elsewhere was dying out, but news of the work in Dickinson, Texas, inspired the rector of the shrine to visit Texas in 1987. Father Giovanni Braschi brought with him many devotional items as well as old rare books in French and Italian. Amongst these treasures was the original Little Manual of the Living Rosary Association along with all of the directives, guidelines and the indulgences, Thanks to all of this information, the Universal Living Rosary Association was formatted exactly as the directives outlined, and continues to this day without deviation from the original text. Who is Patricia Joann Melvin? Patti, as she prefers to be called, 65 years old, born in Tulsa, Oklahoma (both she and her husband, Richard, are Catholics from birth), graduated as a registered nurse from St. Vincent’s College, Los Angeles. Upon graduation, Patti was preparing to go to Tanzania, East Africa, when she met with a near-fatal accident that was to change her entire life. It took months for her to recover from the serious head injuries she sustained. After recovery, Patti worked at the Deaconess Hospital in Spokane for several years, and there she met and married Richard. Though they longed for a large family, none was forthcoming, and they eventually adopted two wonderful sons and moved to Dickinson, Texas. While home-schooling their sons, they acquired a very large book on the life of Saint Jean Marie Vianney and, through it, were introduced to Saint Philomena. As most things do, their work began small. Patti and Richard wrote all the letters and did all the record keeping, packing, shipping and much, much more. It was decided that, for the unity and perpetuity of this important devotion, each person would accept and pray the same Decade of the Rosary each day. This was discussed with the secretary of the Cause of Ven. Pauline Jaricot and her bibliographer, Father Naidenoff, who gave his confirmation of their work from Lyon, France, at his office within the Propagation of the Faith. Through the Universal Living Rosary Crusade, and the intercession of Saint Philomena, Patti and Richard are reaching out to all the world with the healing balm of the Living Rosary. One by one they come in, rich and poor, learned and unlearned, bishops, archbishops, priests, religious, lay apostles and the faithful! Young and old, all are attracted by the simplicity, power and unity of this gift from Heaven. Twenty six years have passed now. 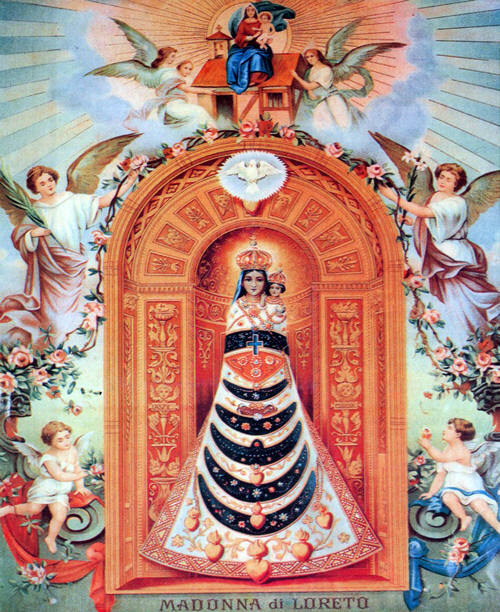 The revival of the Living Rosary and the revival of the devotion to Saint Philomena are clearly connected. When the Melvins began their work, devotion to Saint Philomena was buried in the catacombs of the 20th century. Once again, the faithful are turning to this great Saint who is the patroness of the Living Rosary and of the Children of Mary. The faithful have not been disappointed. 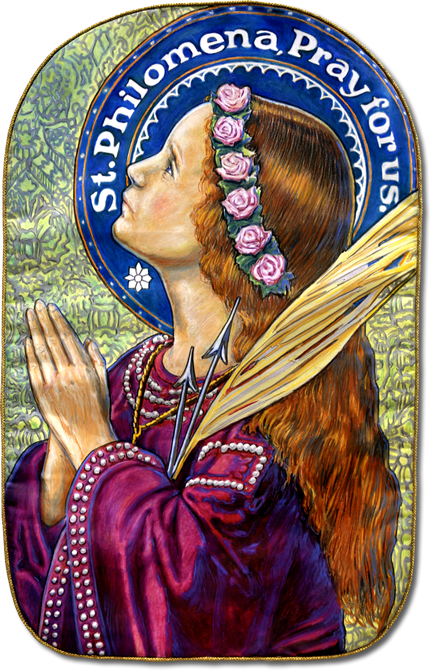 Saint Philomena has dazzled them with her favors and miracles. 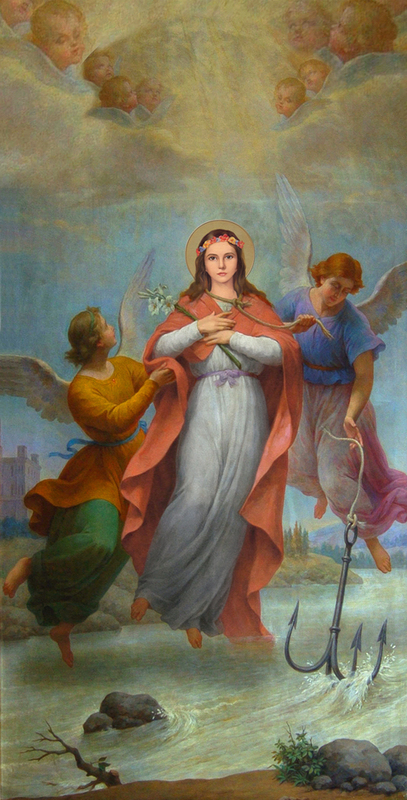 Saint Philomena’s fame has again begun to spread from one end of the earth to the other. After 20 years, Patti’s prayers have been answered more fully than even she ever dared to imagine. 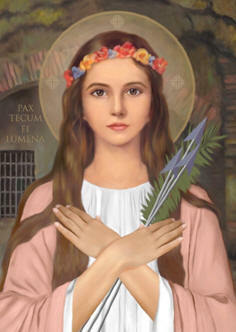 Saint Philomena has been given to the world again through the Universal Living Rosary. When Patti and Richard began the revival of the Living Rosary and devotion to Saint Philomena, it did not take long to fill their home with machines, translations, devotional articles and boxes. They interested companies in making St. Philomena devotionals; books were translated, formatted and published; holy cards, medals and statues were designed. Famous old prints were reproduced and new images created. Through the efforts of the Universal Living Rosary, the principal shrine of Saint Philomena in Mugnano is being restored and the pilgrims pour in from all over the world for her great feast. Furthermore, the entire estate of Venerable Pauline Jaricot has been restored and turned into a pilgrimage center for all of France. The special book of her spiritual mysticism is now available from the Center in Lyon (in French) and Dickinson (in English). It is, in fact, the victim heart of the beloved foundress of the Living Rosary that has provided the fire that is setting the world aglow with prayer to draw souls to the Queen of the Most Holy Rosary and so restore the Church, through fervor, zeal and sacrifice. Through the Universal Living Rosary, we can all help bring about the Triumph of the Immaculate Heart of Mary. When Our Lady’s heart will triumph, then Jesus Christ will reign as King and God’s victory will be accomplished! Over the years, the Universal Living Rosary Association has had close connections in Rome. The late Bishop Peter Canisius Van Lierde, Vicar of His Holiness, and custodian of the Vatican reliquaries, counseled and encouraged them early on. Father Redemptus Valabek (canon lawyer and Carmelite now departed) followed their missionary growth, encouraging and guiding them for many years. It is the mission of the Universal Living Rosary to hasten the Triumph of the Immaculate Heart of Mary, through the DAILY DECADE of the Most Holy Rosary. This article was published in the magazine INSIDE THE VATICAN, Rome, Italy – March 2005 Issue by Silvio Mattacchione, writer and publisher who resides in Canada. In a world of calculations, one may be tempted to ask, ‘Does this little DECADE really make a difference?” The contemplation is not between what I have given and the bottomless abyss that must be filled up but, rather, to Whom I am giving my gift and what HE can do with it. We turn to contemplate the Gospel of the five loaves and two fish offered by the small child in order to feed 5,000 hungry souls. A mere nonsense to even think about if it were not for the Hands in which the bread was placed. THIS IS THE KEY! Let us give all we can for the love of God and the salvation of souls. Placed in the Hands of Christ and the Heart of His Immaculate Mother, though it be little, we shall have reached out to the whole world with the divine nourishment that gives life everlasting! It is the Miracle of Your Love, His Hands and Her Heart! St. Philomena, Ven. Pauline Jaricot and St. John Vianney – their separate lives were inspiring, but the three together were given miraculous rewards by God for their devotion to Him. It is no coincidence that the official Feast of St. Philomena falls on the 10th of August, for that is the very day that the Great Miracle of Mugnano occurred and the day that St. Philomena granted the Venerable Pauline Jaricot a wonderful healing. It was the miraculous cure of Pauline Jaricot which led to Philomena’s being raised to the status of Saint. Pope Pius XI canonized St. Jean-Marie Vianney in 1925 and named him “Patron of all Parish Priests” and said that his spirituality in its totality should be followed by them. This would necessarily include his deep devotion to St. Philomena. The present Pope dedicated 2009 as the “Year for Priests” and has honored St. Jean Vianney by elevating him to be the “Patron of all Priests“. Because he was such a dear friend of the Ven. Pauline Jaricot, her cause for sainthood takes on new fervor. Pauline was not only the foundress of the Propagation of the Faith, she also founded the Living Rosary Association to promote faith through the united prayer of the Daily Decade of the Holy Rosary, and the distribution of good Catholic literature in the wake of heresy and persecution, which was rampant in her own day in the aftermath of the French Revolution. Pope Gregory XVI raised Philomena to the status of Saint and also named her the Patroness of the Living Rosary Association. Pope Pius IX granted to her the glorious title: Patroness of the Children of Mary. The Living Rosary Association founded by Pauline Jaricot in Lyon, France was approved and richly indulgenced by Pope Gregory XVI and accorded official canonical status on January 27, 1832. The Confraternity of Saint Philomena was founded by Fr. Louis Petit in Paris and on November 30, 1886 his Holiness, Pope Leo XIII, raised this Confraternity of Saint Philomena based in France to the rank of Archconfraternity. Saint Pope Pius X named St. Jean Vianney Patron of the Archconfraternity of St. Philomena. 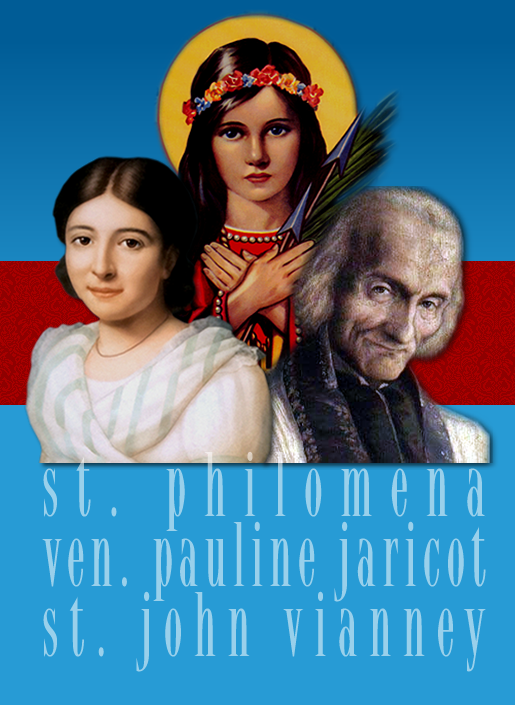 Saint Philomena’s influence was life-changing for both Pauline Jaricot and St. Jean Vianney. 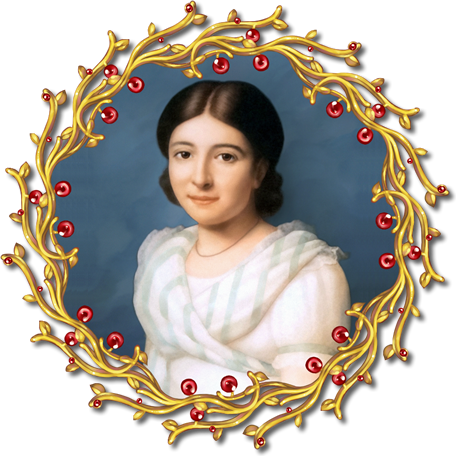 Pauline’s miraculous cure by St. Philomena on August 10, 1835 provided the impetus for formally elevating St. Philomena to the Altar. She then became the only person recognized as a Saint solely on the basis of her miraculous intercession. When Pauline shared the story of her healing with her dear friend St. Jean Vianney (Curé of Ars, France) and bestowed upon him the relics of St. Philomena obtained from the Shrine in Mugnano, Italy, she prophetically said to St. Jean Vianney, “Have full confidence in this great Saint. She will obtain for you all that you ask.” Both St. Jean Vianney and Ven. Pauline Jaricot grew up in the same historical period and both suffered very much from the persecution of the Church during the French Revolution. Priests were hunted down and sent to prison if they would not take an oath to the State. Pauline, herself, was baptized at home by a priest faithful to Rome. The holy Curé saw in St. Philomena a New Light for the Church Militant. Pauline was greatly distressed by the plight of the Catholic Family whose members, young and old, served in factories for very long hours each day and even on Sunday. She longed to establish for them a Community in which they could make a living and have time to pray, attend Holy Mass and spend quality time with the family. She invested her entire fortune in this venture and borrowed heavily from good people who knew of her sound judgment and practical ability to make a success out of all that she undertook for God and country. Pauline was betrayed by a treacherous thief who absconded with her fortune. All that had been invested in this inspired dream of rescuing the working man from the slavery of the industrial age was lost. She was left destitute, calumniated and in ruin. On January 9, 1862, Pauline died bankrupt and abandoned by all. Stripped of everything, she had followed Christ as a victim for souls to the end. She signed her letters: “Your poor beggar”. Clothed in a rusty black dress, her face worn with suffering, breathless with heart disease and dropsy, her expression was not merely one of courage or charity, but it was majestic. Pauline showed royal dignity, her features were full of authority and she possessed a spiritual power that nothing could defeat! Pauline loved without measure! Cardinal Tomko, prefect of the Community of Evangelization, visited Lyon in 1999 and greeted her as a “great figure for the Universal Church, who founded missionary works of world dimensions”. Ven. Pauline Jaricot has rightfully gained her place as the patroness of those in financial distress. She is mother of the poor, advocate of debtors, help to all those treacherously deceived by others, persecuted and maligned. She understands their plight and the accompanying anxieties which haunt them. Call upon Pauline who suffered to the extreme at the hands of the greedy and the proud. She will hear your prayers, ease your burden and obtain for you the special graces needed to carry your heavy crosses with courage and hope! Her heart is sensitive and she will dress your wounds with the balm of the merits she obtained from the Heart of God through the slow martyrdom which she endured day after day. Maria was entrusted with her care by St. Jean Marie Vianney, and tells us, “Often, a halo of light shone around the head of our mother Pauline as she prayed for long hours before the Blessed Sacrament”. Many documents exist which record the special gift of prophecy which Pauline possessed. We have been given by the custodian of Ven. Pauline Jaricot’s artifacts a blood relic; a piece of the cloth upon which her magnificent heart rested during its embalmment. It is soaked with the blood from the victim heart of our beloved Foundress. If you wish to have a piece of cloth touched to this relic, and a prayer to offer Pauline in beseeching her help in your financial needs, write to us and send $3.00 to cover the costs of materials and postage. If you are not yet a member of her Living Rosary, this too will be a healing balm for your sufferings and further win her favor in your behalf. O Pauline! You were once rich and beautiful and admired; yet, you became poor and miserable and despised. Help us to bear poverty, misery and contempt, mild or extreme, for the love of God, the salvation of souls, and for the preservation of the Faith in all its purity. You were the seventh child in a family of nine; your father was the thirteenth child born to poor but generous parents. Help us to accept, with loving surrender, all the children God may entrust to our care, and obtain for us the means needed to provide for their needs, both spiritual and physical. O Pauline! You desired to love without measure and without end. You were full of hope that your Christian Community would provide a singular atmosphere in which the family unit could wax strong, increase and have a deep spiritual formation. To this end, you invested your resources, and borrowed heavily, forming your own trust: Heaven’s Bank What a bitter cup, then, must have been yours, to find that those you had entrusted with all your earthly wealth were smooth-talking thieves who defrauded you of all your assets! Without any respite until death, you struggled to repay your debtors. Besides the bitter anguish produced by your destitution, you were assailed by creditors and tribunals, rebuffed, scorned, and ridiculed by friend and foe alike. O Pauline, how valiantly you bore this heavy cross for the glory of God! How lovingly you embraced the humiliations heaped upon you! With eternal wisdom, you placed your suffering in the tender Heart of Jesus through the Immaculate Heart of Mary, Queen of Martyrs. We wish to honor you, Venerable Pauline Marie Jaricot, as the Patroness of Debtors for the entire world. Pray for us and for all who have need of your intercession. Obtain for us the means to pay our debt in full, or to be released from it but, most importantly, help us to bear it with patience for the glory of God. O Heart of Pauline, furnace of charity for all mankind, comfort and help me in this my urgent necessity. (Here mention your petition.) You have loved Jesus Christ more than all the earth, and for love of Him, you have loved, more than yourself, all those who are in travail and pain. One Our Father, Hail Mary, and Glory Be. The Venerable Pauline Marie Jaricot may rightly be called the Patroness of the poor, debtors, the deceived, the persecuted and the maligned. This great daughter of Holy Mother the Church was born into a family of wealthy silk merchants. She is the Foundress of the two greatest works of the Church in the Nineteenth Century: The PROPAGATION OF THE FAITH and THE LIVING ROSARY. GOD has prepared for those who love HIM. Our life on earth is a warfare! Satan, who is our adversary, has 3 most powerful weapons in his arsenal: The 3 “Ds” ~ the 3 big guns of the Father of Lies … DEPRESSION, DISCOURAGEMENT, DESPAIR! It is so vital that we explore, embrace and present the JOY of the Catholic Faith, unknown by many but, more often than not, forgotten by almost all. Saint Jean Marie Vianney told his faithful that, for those who love God, there is always springtime in the heart. JOY is far from artificial gaiety or a big smile. It is not something you can turn on or even go in search of. JOY is an overflow from a life that is fully lived in Christ. In spite of all conditions of body or even dryness of the soul, JOY is an effect of the presence of the Holy Spirit within us. When a person has found the ONE THING in the whole world, which is the key to everything else, the joy resulting from this discovery is bound to be unique. We begin our approach to God through faith. We must grasp those remarkable things, which are unseen. Once we realize the Life of Christ within us, we will not keep Him locked in our hearts. This faith and joy we will take with us everywhere we go. Those around us will have the joy of seeing Christ in our actions, reflected and refracted in a thousand encouraging words, friendly gestures and unselfish acts of generosity. JOY is the most infallible SIGN of the PRESENCE of GOD! Through our precious Catholic Faith, we have the JOY to love God. Our love for God must be authentic. It cannot be mere sentiment or consist solely of words. To love God is nothing more than having our will united to His, wishing always to see the Will of God exalted and fulfilled. Our friendship with God begins in Faith and Hope but it is not complete until it develops into love. The only way we can show that we love God is through our zeal to see that His Will be done “on earth as it is in Heaven.” Proof of our zeal is obedience to God’s Law and the direction of all our actions for His exaltation, honor and glory. We cooperate freely in His plan of redemption and this co-operation itself is a source of great JOY. The JOY of Heaven will be the result of our union with God. Rise up! Rise up quickly, Dear Soul! You have no reason to deprive yourself of its joy. God is so eager to forgive. He wants to spare mankind from destruction and He will do so if only a relatively few number of godly people can be found. We can see from the parable of the prodigal son that, upon the return of the son, the joy which is by far the greatest is not that of the repentant son, but that of the father who witnesses his return. The thrilling fact is that participation in the Life of Christ means participation in His divinity. WHAT ELSE IS SUPERNATURAL LIFE! As fishes live in the sea, as birds live in the air, we live in Christ. When the Life of Christ really takes possession of a soul, it floods the soul, makes it aflame with divine truth and goodness, and gives it a brightness which, at times, shows on the faces of the saints. Many of us keep this bright flame under the blanket of the ashes of venial sin. One by one, week after week, they construct a wall between Christ and us, keeping Him at a distance. The life we have BY CHRIST, IN CHRIST and WITH CHRIST is Sanctifying Grace. If we understood this properly, the only thing that would concern us every day of our lives would be to gain an ever-increasing amount of Sanctifying Grace. There is mediocrity in our lives because the joy of growing in Christ’s Life is not understood. Christ is left out of any of our actions that are in contradiction to His teaching. The Catholic who gives himself totally to the practice of his faith possesses within himself, a well-spring of JOY. While Christ is the Way, the Truth and the Life, He is also the splendor of the Kingdom, which will be swallowed up in Eternity. Through grace, we have become sharers in the glory and privileges of the Only-Begotten Son. It is because His Son is in us that the Father can have for us a Father’s Love. No father is satisfied if his children simply stay out of trouble; he wants them to accomplish something of which both he and they can be rightly proud. As the members of our body are always working together for the good of the whole, so the members of Christ’s Mystical Body experience a deep JOY in serving one another. Each is truly dedicated to bring both physical and spiritual health to those who are sick. They will be judged as having done to Him whatever they have done for one another. St. Teresa of Avila spoke to a group of priests with this plea of love, “Christ has no body now on earth but yours, no hands but yours; yours are the eyes through which Christ’s compassion is to look on the world; yours are the feet with which He is to go about doing good, and yours are the hands with which He is to bless us now.” Ours is the awesome JOY of having Christ’s Love, for men pass through us to them. We are the channels of His Love. It is our high privilege to manifest it to all with whom we associate. But how often do we do just the opposite, looking for pretexts to avoid offering our spiritual brothers and sisters a word of greeting, good counsel, comfort, sympathy and encouragement. We are surrounded by people who are spiritually thirsty, and we fail to give them the water which Christ has given us. We hoard the living water He wants us to dispense, thus depriving ourselves of giving JOY and our fellowman of receiving JOY. There is nothing that draws people to God more than to see the light of His love in the faces of those who claim to be His spokesmen. No man is an island, the sorrow of one is the sorrow of all; the joy of one is the joy of all! Our every grace, every virtue, every gift comes from the Holy Ghost, the Spirit of God. Every movement of our soul towards God is through the Holy Spirit alone. He is the principle of life for the Mystical Body of Christ as the soul is the principle of life for our physical body. Come Holy Spirit, expand our Souls with the JOY that is the beginning of Eternal Life! Those who belong to Christ’s Church NEVER had to be concerned that they would hear a different doctrine preached or see a different liturgy offered, from one country to another, one century to the next. Sorrowfully, today, this is no longer true. This deep source of JOY is now part of the weapon Satan is wielding in order to bring about … DIVISION, DEPRESSION and DESPAIR. We beg God that, once again, through our prayer of suffering, the Church will exult in the soul-stirring unity that has always marked her public worship of God. Every denial of truth involves falsehood. The devil is the Father of Lies. Gloom accompanies the darkness of falsehood. Any man who cuts himself off from God and his fellow man becomes an island, joyless and desolate. Satan was the first fool in the spiritual order and the only satisfaction left to him is to make fools of human beings. His enormous success is sadly evident. To fool means to treat with utter contempt: to disappoint, defeat, to frustrate and to deceive. Most people detect this treatment in worldly matters but, in the spiritual order, they seem not to realize what is happening. Wisdom gives us the JOY of judging everything in conformity to the mind of God Himself. Wisdom, it is that makes us realize we have only the present day, the present hour, and that the past is over forever. The future is in the Hands of God. It is a total lack of Wisdom for any man to sit in judgment of his fellow man. His own vices and shortcomings are often more obvious than the man he is so eager to judge. To acknowledge our failures, weaknesses and mistakes is true Wisdom. Peace is a word that is greatly misunderstood. Peace is not the absence of disturbance or war or hate. It is not a negative quality. PEACE is the GIFT of tranquility of order. Some foresee peace as a thing dull and boring – inaction. Not so! God made man’s body for action and He would not ask man to settle down in a glorified state to an eternity of inaction. To be peaceable does not mean to be passionless. Virtues are passions in right order, while vices are passions in disorder. Peace of mind cannot be obtained without order in the mind. Order is the effect of truth. When man’s mind is divorced from truth, his mind is in disorder. Peace of heart depends upon the order that exists in one’s will. If peace of mind is combined with peace of heart, a man’s spiritual house is in perfect order. The peace, which Christ imparted to His disciples, was a peace which could be won only by those who were willing to fight. Peace is the perfection of JOY. In order to bear the peace of Christ, we must rid ourselves of all the sinful disorders that weigh us down. All the joy we possess through membership in the Church, as well as the joy that will be ours in Heaven, has come to us from the Cross. It was for me that Longinus opened the side of Christ with his lance that I might enter there and rest in full security. The exchange between Christ and the Good Thief was like a ray of light piercing the gloom that hung over Calvary. Good Friday was the saddest and the gladdest of days. Christ gave us His mortal Life that we might be saved from eternal misery. All our joy in believing, hoping and loving proceeds from the Cross. Our Lord looked down at His Blessed Mother and, for a brief moment in the midst of all His suffering, a warm feeling came over His Heart. What a wonderful creature was Mary, His Mother! And, now, He would proclaim to the world what place she would occupy in the sphere of redemption. Through Her, all would come to Him; Through her, He would go to them. Mary would be the symbol of His Church. Already, He had told His disciples that, if they took up their crosses daily and followed Him, they would be His brothers and the sons of His Father; now, He announced to them that His Mother would be their Mother, the Mother of all Christians. Let us pray that the whole world will come to know Mary, for surely this is one of the greatest JOYS given to us as God’s children. It is a difficult saying to hold out suffering as a blessing. But, this is what Christ calls us to hold. Blessed are those who are persecuted and reviled for My sake, theirs is the Kingdom of Heaven! Every pain that afflicts us is a manifestation of the Will of God. Many will be surprised to hear this, that God should wish our suffering. The plain truth is that the CROWN can be gained only through the CROSS. There is no other way to glory for us than that traversed by Our Lord. In His Will is our peace. In His peace is our joy. The fact that we cannot understand His purpose in a particular trial should not lessen our gladness in carrying out His Will. Every cross is a purification! Flowers yield their full perfume only when they are crushed. In the spiritual world, we find fulfillment when our will has been crushed and re-fashioned to match the Master’s Will, from which flows all peace and joy in this world and in the next. By raising our minds and our hearts to God a thousand times daily, in petition, thanksgiving, adoration and oblation, we begin to live in His presence. Such conversation with God is one of the supreme joys during our earthly sojourn. Lay your needs at His Feet and have absolute confidence in His power and mercy. Above all, beg God to give you the grace to do perfectly His Will. We have the three-fold JOY of Holy Communion… Nourishment, Union and Charity. Saint Paul expressed that the purpose of this Sacrament is to make us one with Christ and all the members of His Mystical Body. “This Sacrament is the very soul of the Church,” says Pope Leo XIII, “from It, the Church draws all Her strength, all Her glory, Her every supernatural endowment and adornment and every good thing that is Hers.” The Holy Sacrifice of the Mass is the culmination and center of Christian religion. Every day for the Church is both Holy Thursday and Good Friday. The Eucharistic Sacrifice is an act of perfect adoration. The cleansing stream of Christ’s Blood flows anew during the Mass, washing away the sins of those who are truly united with the supreme Priest as he offers the perfect act of atonement in their name. We turn away after Mass, not as from something finished, but as from something begun. The Catholic Church regards Mary as God’s masterpiece. What cause for joy does the thought of Mary well up within us! If we are criticized for the prominence we give the Mother of God, we take our cue from the Master Himself. He placed Mary at the very center of the mystery of Redemption. If our praise of her is regarded as extreme, we reply that no praise of her has been greater than that contained in the salutation of the Angel Gabriel, who said to her, “Hail Mary, Full of Grace!” (Lk. 1:28) Mary is the Treasure of the Lord. We rejoice in her sinlessness. No mother has ever been so eager to obtain favors for her children, as Mary is for us, and no mother was ever given more power to do so. We have only the faintest idea now of the joy that will be ours upon finding Mary waiting to welcome us on the shores of Eternity. Hail Holy Queen, Mother of Mercy, Our Life, Our Sweetness and Our Hope! One of the most exciting truths about our Faith is strangely neglected. Every one has his own Guardian Angel who acts as a companion, counselor, guardian, consoler and intercessor. By and large, we not only pay no heed to his influence in our lives, but we utterly disregard his very presence. We should realize that we are depriving ourselves of a substantial joy by not being aware that we have at our side, such a powerful and charming friend. The important part Angels play in our lives is revealed, time and again, in Holy Scripture. Michael emerges as the great heavenly Warrior, Gabriel appears as the Messenger of joy and Raphael is regarded as the Angel of health and healing. In the Book of Tobias, we read how Archangel Raphael made himself the companion of young Tobias on a journey he made at the request of his father. Raphael saved the young man from being injured by a huge fish, helped him choose a wife, collected a debt that was owed his father and drove out evil spirits. The old Tobias was blind and vision was restored to him. Great light is thrown on the way Angels deal with man by the statement which Raphael made to the two Tobiases as he prepared to leave them, “Come let me tell you the whole truth of the matter… When thou, Tobias, wert praying, when thou wert burying the dead and leaving thy supper go untasted, I, all the while, was offering that prayer of thine to the Lord. Then, because thou hadst found favor with God, it was necessary that trials must come, and test thy worth.” Raphael and our Guardian Angels are waiting to bring into our lives the joy that was brought to Tobias. When God appointed an Angel to go before the chosen people in the desert on their way to the Promised Land, He said, “And, now, I am sending My Angel to go before thee and guard thee on thy way, and lead thee to the place I have made ready for thee. Give him good heed, listen to his bidding; think not to treat him with neglect.” (Ex.23:20,21) Our first obligation to our angels is to have reverence for their presence. We are protected by a prince of the heavenly army, one of those chosen spirits of whom Christ said that they always see the Face of God — this conviction fills us with reverence, devotion and firm confidence. No friend on earth is as ready to console us in the hour of grief, help in times of difficulty, illumine us in the hour of temptation and bring joy into our lives. It is in the work of extending the Kingdom of Christ that we, Christians, should mainly seek the joy of action. There can be no greater accomplishment for one who believes in God than to be instrumental in bringing His Life to other men. The harvest is plentiful enough, but the laborers are few. Never have such vast fields been ready for harvesting as today. The times in which we live are torn by serious errors, and are troubled by violent disturbances, yet, the Church’s laborers in this age have access to enormous fields of apostolic endeavor. The hour for positive action has sounded. What is to be thought of anyone who would linger, passive and sluggish, deploring the evils of our day and taking pleasure in criticizing those of their brothers who show more generous goodwill than they do? “What is most necessary today is not more schools, more churches, more priests: NO, the prime necessity today is to have in every parish a group of laymen – virtuous, enlightened, resolute, fearless and truly apostolic.” (Pope St. Pius X) At Baptism, all Christians are given the canonical mission to convert the world. Whether we eat or drink or do anything else, let us do it for the glory of God! Every believer in this world must be a spark of light, a center of love, a vivifying leaven amidst his fellowmen. HAVE COURAGE, HEAVEN IS YOUR HOME! Heaven is not the subject of many a sermon. As a result, we deprive ourselves of the joy, encouragement and inspiration that the thought of Heaven would give us. Heaven means the end of everything that is unpleasant and painful. It means rest and peace, after the toil and battle of earthly existence. HEAVEN MEANS GOING HOME! Above all, it means the eternal vision of God. We will have a marvelous freedom of action and our glorified bodies will shine with a brightness reflected from our beatified souls. Our idea of God is weak and hazy and our joy at the thought of Heaven is not what it should be. In seeing God, we will see all things. In possessing Him, we will possess all things. In Heaven, we will be filled with the knowledge of all things that God has created and with the knowledge of God Himself. If you have loved somebody with a great, enduring and holy love, you will rejoice that, in possessing God in Heaven, you will also possess this loved one with all of his or her loveable qualities purified and heightened as well as divinized. And Follow Him more closely! YOU ARE THE TEMPLE OF GOD, FOR THE SPIRIT OF GOD DWELLETH IN YOU! It is the Holy Ghost Who creates, renews the face of the earth, works miracles of grace and, by His power, raises the bodies of the dead. The Holy Spirit comes forth to complete, beautify and sanctify the whole of creation. The Paraclete takes up the work of the ascended Christ and brings all His teaching into fruitful light. His mighty operations apply the Precious Blood of Calvary and complete the Redemption. He that rejects Him shall find no comfort. He who grieves Him shall be eternally lost. How happy we are to bear the Paraclete within us, and how sacred is the heart wherein He dwells! Where the Holy Spirit dwells, where He works the grace of a new birth and unites the members of the fallen Adam to the humanity of the Son of God, there must be true life ~ life of the Deity. If this vitality of the Church proceeds from the breath of God and depends upon His continual presence, it cannot fail… It is everlasting! ALL THE SACRAMENTS are sensible signs of the action of the Holy Ghost giving grace to the soul: Water in Baptism, holy chrism and imposition of hands in Confirmation, anointing of the sick with oil in Extreme Unction, and so on. The material element of the Sacraments was implemented by Christ in their administration because human beings are composed of body and soul. The person receiving the holy Sacrament knows that he is doing so, and must believe in the interior effect of the outward sign. A Sacrament cannot be given to a DEAD PERSON nor can it be administered REMOTELY! The minister must be near the recipient so that they are in immediate, sensible contact. Through the Incarnation, the Son of God became man. He did not become a human person, but a divine Person, with a human nature, united to the Father and the Holy Ghost in the infinite Godhead. The Resurrection of His Body is very much a part of the REDEMPTIVE MYSTERY and TRIUMPH. For this very reason, we must recognize the entire Biblical tradition regarding the reverence toward the dead, the thoughtful burial of their bodies, and the continued remembrance of their burial place as a preparation and presage of the burial of Christ. The burial of a body as an act of reverence is as much a part of the tradition of the people of God, as the burning of the body is a part of the Pagan tradition. The children of Israel carried the bones of the Patriarch Joseph with them out of Egypt and into the Promised Land forty years later. Anyone who has his body burned positively departs from the BIBLICAL and CHRISTIAN tradition. It should be made clear that cremation is a pagan act! It is an unspoken rejection of the Doctrine of the Resurrection of the Body, whether the person realizes this or not. As partakers of God’s nature, we are given a divine dimension by the fact of our Baptism through Sanctifying Grace. Through this Grace, we are engrafted mystically into the sacred humanity of Christ, our Savior and Redeemer, as is written to the Galatians: “For you are all the CHILDREN of God, by faith in Jesus Christ.” (Gal.3:26) Through this union with Jesus Christ, our souls are eternally transformed, marked and empowered, so that we are no longer human beings but “Christians”. By Baptism, we become adopted children of God, heirs of all that Christ gained for us by His PASSION, DEATH and RESURRECTION; we also become temples of God (1 Cor.3:16), bearers of the Most Blessed Trinity, visible members of Christ, our Mystical Head to quote Saint Paul: ONE BODY, ONE SPIRIT! For this very reason, Christians learn a demeanor which is rigid and outstanding, one that separates him from the world. The physical deportment of a true Christian sets him apart from the rest of the world: his modesty, his dress, his demeanor, his whole manner and the value he places on material and passing things. He is a sinner very much in need of mercy; hence, he must live in a posture of humility, penitence and love. He has received a divine dignity, which requires that his conduct be imitative of Christ. Let us suppose the Blessed Virgin Mary had taken steps, once the Sacred Body of her Crucified Son was taken down from the Cross, to have Him cremated, so that she might keep His ashes with her always. The thought is blasphemous. Hardly less should Catholics have their bodies burned up. Cremation is a disturbing trend among modern Catholics! Christ was to rise again from the dead, and so are all those baptized in Christ to rise from the dead. And, on that final day, each will be confirmed in the Spirit for all Eternity. We always surround, with reverence, the burial of our loved ones as a sign of our respect for that person, our faith in the Resurrection but, especially, because his body was a temple of the Holy Spirit and a vessel of grace, which will live eternally. At the death of a loved one, all gather around his body with the priest at the head to beg God’s mercy upon his soul. We are all guilty of venial sins and each one must be totally repaired by prayer, sacrifice and Holy Masses. The doctrine of Purgatory is very clear. At the funeral Mass of each Catholic, the priest escorts him into the Church making a plea for his eternal rest. Saint Paul refers to death as one being asleep. At the Second Coming, those who have gone to Heaven will form Christ’s great entourage, as He comes to judge all men. For the life of the faithful, O Lord, is altered, not taken away! The true Christian ponders the Scriptural promise that the bodies of the dead of the saints will be raised up to incorruption. To be sure, God can raise the ashes of the cremated to life and will do so, for God can do all things. But cremation most certainly is not pleasing to Him, as it is contrary to the tradition of redemption. Every speck of it is of infinite worth; for with its tiniest particle, man can buy Heaven! Any split second is wealth enough to purchase an Eternity of Bliss! TIME is a commodity we waste with all of the recklessness of a sailor who squanders his money on a drunken shore leave. TIME is a commodity for which we hunger and crave like a half starved beggar. Few of us realize that no matter how pressed we are for TIME, we always have enough of it to achieve man’s only purpose for existence and life’s one ultimate goal; for we have the present moment; and that is all the time in the world. Every tick of time comes from Him, Who is timeless. God made you to be happy in time and throughout all eternity. But, none can be genuinely happy unless he takes “HIS TIME” and does with it what God desires. He gives you time that, like Christ, with it, through it and in it, you may help Omnipotence discharge one of His eternal decrees. You have this passing NOW of time that you may help God carry out His Plan. The hour has struck for you to assist the Infinite in the governance of the universe. Once you realize that, you can TRULY tell time. Think what a Christian meant to St. Paul and the men of his times, and what it means to the men of ours. In those days of long ago, the pagans had no difficulty recognizing Christians. “Behold, how these Christians love one another!” was no mere rhetorical expression. Today, how do we Christians stand out, in any way, from the pagans around us? If we do not find God, it is not because He is too far away, but because He is too near! For the Triune God is in us by His Wisdom, His Goodness and His Power. God is thinking of you NOW! God is willing you NOW! GOD is working in you NOW! Were God to forget us for the slightest tick of time, we would cease to be. We are, because HE is. Ours is a living God! Ours is a living Faith! Too often the truths of our Faith about God are allowed to be dead. Providence is a truth that throbs with love and life for each of us personally. Literally, it enfolds us in a paternal embrace and keeps our tiny human hearts beating against the great Heart of God. We are HIS members! We then must be Flames in that Light! By Baptism, men are made “the Flesh of Christ” as Pope Leo the Great taught. God is not only watching you right now, He is working in you. What does God require of you? That you do His WILL! Grasp this truth and hold it to your heart: Nothing, absolutely nothing, happens in this universe, but by the Will of God or His permission! We know that God is Good. In all truth, He alone is good! Hence, there must be a vital purpose, an infinitely wise and good purpose, for whatever He sees fit to will or permit. God’s Law is written into our beings and obedience to this Law gives us the greatest liberty! It leads us to the accomplishment of “CHRISTHOOD!” The fate of the immediate future, which unquestionably will spell the fate of the world, lies in Catholic laborers. If they “baptize” their work and their world, mankind is saved. And, they are the only ones who can do it. Our Father presents the Gospel of Christ to the world of workers, only through His members! This baptism must be of “blood” for it will take red-blooded men with wills of steel, completely devoted to Christ and totally without compromise of any Christian principle. If, when we enter our place of work, we leave God outside, more than half of our lives are lived without conscious communion with the only ONE through whom we can live. We owe God worship with our whole being every hour that we live. Dr. Alexis Carrel has claimed that the fundamental cause of our decadence is a loss of “a sense of holiness.” He is talking about precisely what we have been thinking right along, for a “sense of holiness” comes down to the awareness of the presence of God! If we have it, we will go to work with the same attitude of soul and purpose of will with which we go to church. Right now, you have a God-given career involving self-surrender and service; in this career, there is really only one virtue ~ humble conformity to the Will of God, and only one sin ~ defiance of God’s Will. We do not consider the entire day. We have reduced our concern to the only time we have. The only time there will ever be ~ the NOW! Let man do his duty, no matter how humble it may be, and he has contributed some-thing to the fulfilling of God’s all-wise plan of “re-establishing all things in Christ”. If God be God, He is breathing in everyone who is right now drawing a breath. Theology tells us that God never does anything without a purpose. If God be God, that purpose can ultimately only be Himself. Hence, every living human being has and is now acting, a veritable career: one that comes from God and is for God. There is no useless human being. Every creature is good and every creature has an exalted career. We are made to His Image and Likeness. Consider Christ’s life upon earth. “Is not this man the son of the carpenter?” Remember where He was born, and of whom, in a cattle shed of a peasant girl. Remember His nationality and race. He was the poorest of the poor. That is how He was born, that is how He lived, and that is how He died. He had to use the manger, cattle used at birth. He died on a criminal’s cross and was buried in a borrowed tomb. This Man, Who, after 30 years of ordinary and insignificant life, knew opposition, frustration, and apparent complete failure, is the Man Who saved the world. He did it by always doing the Will of His Father. Our career is a Christ career. We must save mankind by doing the Father’s Will. That is the greatness to which we ordinary men have been called. Christ’s life-work was the reparation of the Father’s glory and the redemption of mankind. To sum it all up, let it be said that OBEDIENCE saved the world and nothing else. Nothing else will save it now. You may say: “How can I save mankind, when I can’t even help myself at times?” What is utterly impossible to you, as a human being, is made easy for you as a baptized child of God. What Jesus Christ was by nature, we become by grace. We have been given all we need in nature and in grace. All that is needed for our triumphant success is our obedience … our doing the Will of our Father. God needs you to complete the work of Christ on earth. It does not call for miracles, you do not have to cleanse lepers, multiply loaves, change water into wine, or raise the dead to life. None of these things would have saved the world, had not each, at its particular moment, been the Will of the Father for the Son. Christ is waiting to use your will in order to “do always the things that please” the Father. You can learn how simple it is from the greatest Woman who ever lived. Mary of Nazareth never did anything great in the eyes of her fellow humans while she was on earth, yet she is the Mother of the Mystical Body of Christ. She said FIAT! “BE IT DONE UNTO ME!” FIAT! It was with this word that God began creation. Here, we see the beginning of re-creation, by the same word. See your Mother and see what she did to become Co-Redemptrix of the world. For, this is your creed in a single word! You have been given a share in God’s own nature; you have a free will that has been made powerful through your FIAT. You are a “sacrament” ~ a sacred sign, a visible means of invisible grace. You are a savior. All this, by the Will of God! Like Mary, but in a lesser degree, you are to be a co-redeemer; but you will never be this, unless, like her, you make an unconditional surrender to God. The total gift of self, the wedding of your human will to the divine ~ this is the only way to save yourself and others. It is the Will of God for us today. The Ten Commandments can be expressed in one: THOU SHALT LOVE! This is the command that is to rule your life not only now but for all eternity. To many of us who go on repeating: “If I only knew God’s Will in my regard …” You are what you are, you are where you are, and in the condition, social stratum, economic rating and cultural group because God so willed it. God foresaw this from all eternity. God wants you to love Him, love yourself and love your neighbor. Do you radiate Christ at all times and in all places? Have you taught others about Christ by the manner in which you lead your life? If not, you have been imprudent and improvident; you have not been doing the Will of God; for you have not loved. The mistake of our age is to think that Christ’s Mass consists entirely in what happened on Calvary or takes place on the Altar of your parish church. If you have not been living the Mass all your life-long, day and night, you have not been loving; you have not been living at all. We must not only do the Will of God, but also be aware of the tremendous word: ACCEPTANCE! We must embrace God’s HOLY WILL! Acceptance does not mean any mere nod of the head in agreement or reaching your hand out to take from God whatever He wills to give; it means LOVE: A TOTAL giving of self! The man who lives this acceptance of God’s Holy Will is a man apart from the rest of the world. He has an air of dignity, tranquility of a soul, is in control of his emotions and passions; he is serene, he is simple, and reaches out to all who suffer and labor with a warmth of love that is frankly divine. A woman has only one duty in life – to love! She has but only one destiny – to become her real self. A wife and mother can never be small, mean or selfish – and claim the sacred titles of wife and mother. She must ever be what Mary was and Christ is: LOVE that is SACRIFICE ~ SACRIFICE that is LOVE. She mothers not only her children, but a good wife actually “mothers” her husband that, by participating in his life, she brings to birth the deepest and best in him. Companionship on this level is life giving! We are not on earth to learn how to say prayers but to become prayer! Never cease praying!!! DO NOT Extinguish the Spirit! Hold to that which is Good and have NOTHING to do with any kind of Evil. There is only ONE Real Evil in the world … and that is not Death! We are losing our sense of sin. Cancer is not the evil! Heart trouble is not sin; therefore, heart trouble is not evil. Disease, disability and death are not sins; therefore, they are not evils. Each can be for me God’s Will at any moment. How will I meet them? Pope Pius XI told us that, if we did not turn to prayer and penance, God would be forced to let Satan loose. Our Lady at Fatima admonished the children to prayer and penance. We did not pray. We do not practice penance. What can we expect? What God permits we are to face and fight. When we have done our outmost and still face failure, then we can smile and say FIAT. For, we can be sure that it is God’s Will for us right NOW. Job says with clarion clarity: There is only one loss that can be called evil – and that is the loss of Grace. Sin is the only evil under the sun. When will we Christians learn this? It is by adversity not by prosperity that God proves the fidelity of His servants and separates the wheat from the chaff. Every cross, every affliction is a blessing from God! Remember! The CROSS means SALVATION! Under that sign, we conquer the world’s only evil: SIN. If ever the world needed red-blooded, full-blooded, fiery-blooded followers of Christ, it needs them NOW! Christianity is not in danger, for God is still God and faithful to His promises. The gates of Hell shall not prevail. But, too many Christians are in very grave danger; for they are not intent on doing the one thing necessary for life everlasting, the Will of God in their regard. When the final moments approach in your life, everything will depend upon the state of your soul in that NOW which will never end… the NOW of Eternity! If I have formed in my life that sacrament of the moment, always living and in love with God’s Holy Will, why should I fear? Upon His deathbed, Christ made a special bequest. As a final legacy, He left you His Mother to be your mother. RECALL HER SEVEN SORROWS. She, your mother, is the gateway of all grace – and very especially that final grace no man can merit, the grace of final perseverance! She is the Help of Christians, omnipotent in her power to supplicate! She is the Refuge of Sinners, Queen of the Universe! Where will she be and what will she be doing when you face your final NOW? Do you know anything about a mother’s love? Do you realize the lengths any mother will go to save her child? Have you ever realized all you mean to Mary, not for yourself, but precisely for what you are “IN CHRIST JESUS”? She is the Woman told of in Genesis, the one who was to crush the head of Satan. She is the Woman clothed with the sun. She is your hope … how can you fear? As we live so shall we die, and as we die so shall we live for Eternity. If we live from NOW to the next NOW striving always to do God’s Will, we will die doing just that and nothing else. This present NOW may be our last. Live it to the hilt of its holiness by taking it from God and for God, accepting all that it holds as His manifestation of love and trust in us, and return it to Him as the good servant returned his talents: DOUBLED! … IN ME … NOW! I do not know, Oh God, what awaits me today. I only know that nothing will happen to me except what Thou, from all eternity, hast FORESEEN, ARRANGED and ORDAINED. It is enough, Oh God, for me to know this. I adore Thy eternal, inscrutable dispositions and I submit myself to them for the love of Thee. I desire everything Thou desire and permit to happen to me. May Thy most Holy Will, worthy of eternal adoration and exaltation, be done in all things! Amen. I’m Zoltán Kollonay concert pianist and composer, from Hungary. I wrote a piece of music, which is titled: Holy Pfilomena Legend. The world’s first performance will be the 2012th 08th 31st Pecs, Hungary, in St. Peter’s and St. Paul’s Cathedral. The piece was written for trombone and organ. The Legend of St. Pfilomena respectfully invite the presentation of a large, listen to the concert. You are currently browsing the Universal Living Rosary Association of Saint Philomena (ULRA) blog archives for September, 2012.